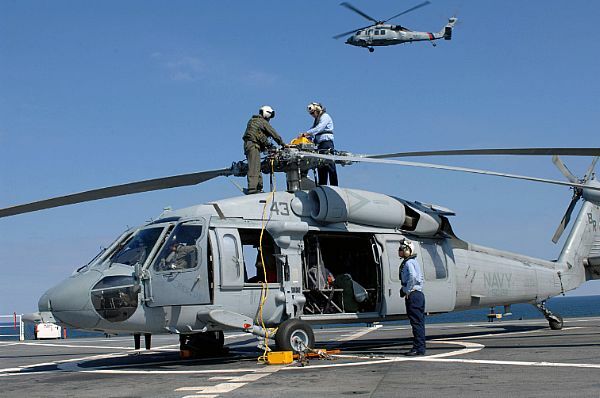 ATLANTIC OCEAN (Oct. 14, 2007) - Members attached to Helicopter Sea Combat Squadron (HSC) 28, secure the propeller on an MH-60S Seahawk aboard Military Sealift Command hospital ship USNS Comfort (T-AH 20) in preparation for return to Naval Station Norfolk. Comfort has completed its four-month humanitarian deployment to Latin America and the Caribbean, providing medical treatment to patients in a dozen countries. PACIFIC OCEAN (Feb. 24, 2008) After lifting off, landing signal enlisted, Aviation Boatswain's Mate (Handler) Lowel A. Shorey III directs one of two Army CH-47G Chinook helicopters attached to the "Night Stalkers" of the 160th Special Operations Squadron, performing deck landing qualifications aboard the amphibious transport dock ship USS Juneau (LPD 10). 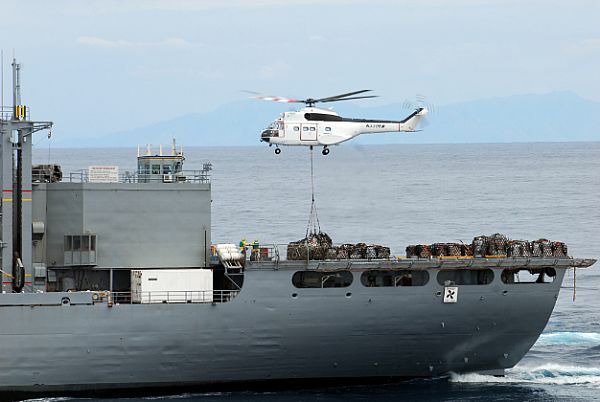 Juneau is part of the Essex Expeditionary Strike Group participating in the annual bilateral exercise Balikatan 2008, between the Republic of the Philippines and the United States. During the Balikatan 2008 humanitarian assistance and training activities, military service members from the United States and the government of the Republic of the Philippines work together to improve maritime security and ensure humanitarian assistance and disaster relief efforts are efficient and effective. ATLANTIC OCEAN (Feb. 25, 2008) Mass Communication Specialist 2nd Class Andrew King and Mass Communication Specialist Seaman Jonathan Pankau hover above the amphibious assault ship USS Nassau (LHA 4) inside an SH-60 Seahawk helicopter while taking photos of the strike group in formation. The ships of the Nassau Expeditionary Strike Group came together in formation as they transit the Atlantic Ocean headed for the Navy's 5th and 6th Fleet areas of responsibility. 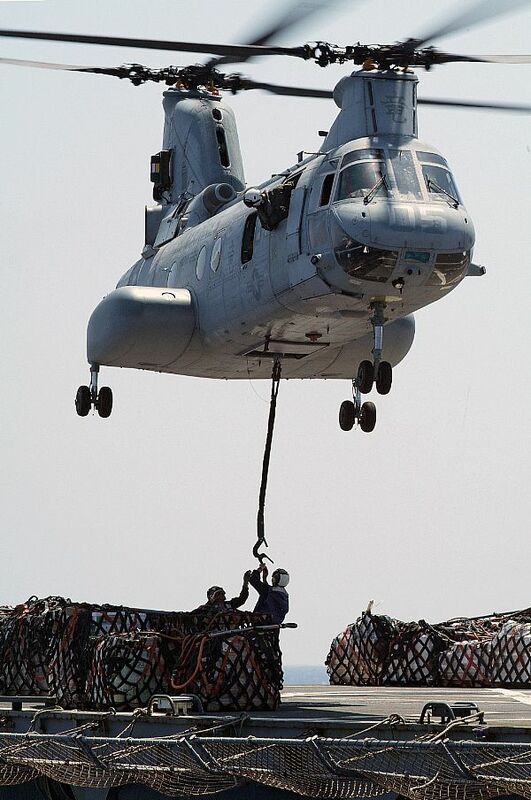 SOUTH CHINA SEA (Feb. 29, 2008) An SA-330 Puma helicopter transfers pallets from the Military Sealift Command combat stores ship USNS Niagara Falls (T-AFS 3) to the amphibious assault ship USS Essex (LHD 2). The Essex Expeditionary Strike Group, lead by the Essex, is participating in Balikatan (BK 08 ), a bilateral exercise between the Republic of the Philippines and the United States. 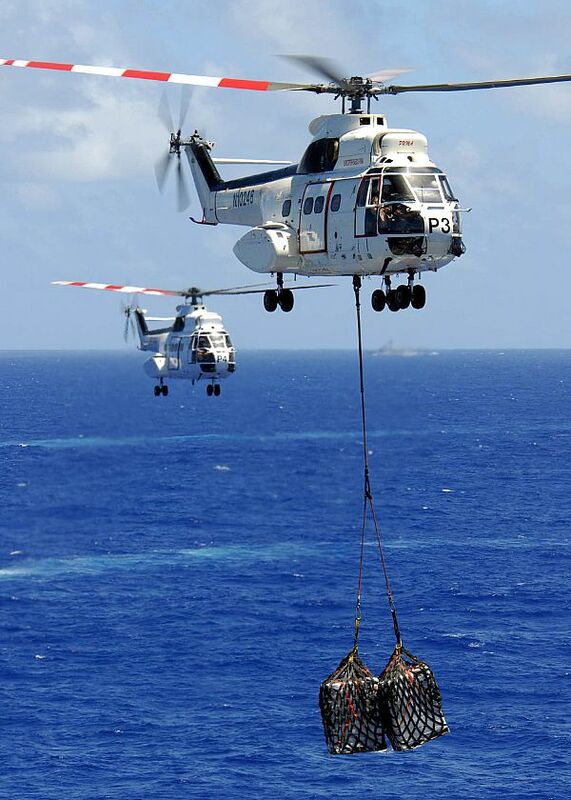 During BK-08, military service members from the United States and the Republic of the Philippines work together to improve maritime security humanitarian assistance and disaster relief programs. 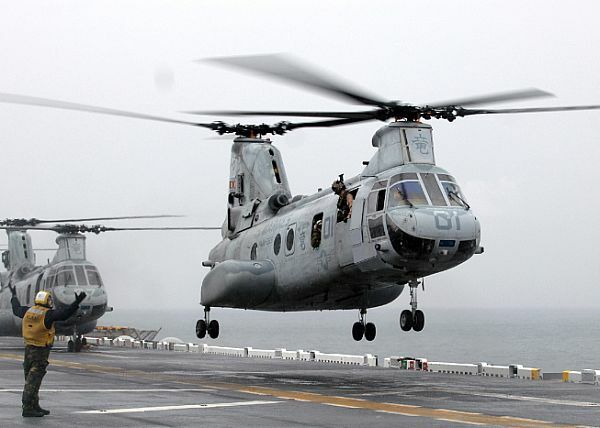 EAST CHINA SEA (March 11, 2008) A Marine CH-46E Sea Knight helicopter, assigned to Marine Medium Helicopter Squadron (HMM) 265 departs the flight deck of the amphibious assault ship USS Essex (LHD 2), March 11. Essex is the lead ship of the only forward-deployed U.S. Expeditionary Strike Group and serves as the flagship for Combined Task Force (CTF) 76, the Navy's only forward-deployed amphibious force commander. 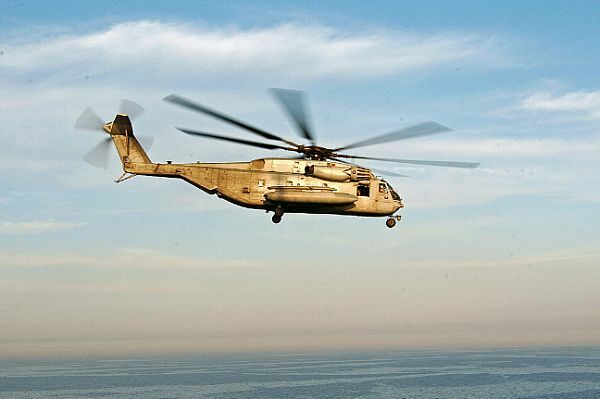 PERSIAN GULF (March 10, 2008 ) A CH-53E Super Stallion, assigned to Marine Medium Helicopter Squadron Reinforced (HMM 166) (REIN), takes off from amphibious assault ship USS Tarawa (LHA 1). Operations in the U.S. 5th Fleet area of responsibility are focused on reassuring regional partners of the Coalition's commitment to help set conditions for security to help promote regional stability and global prosperity. 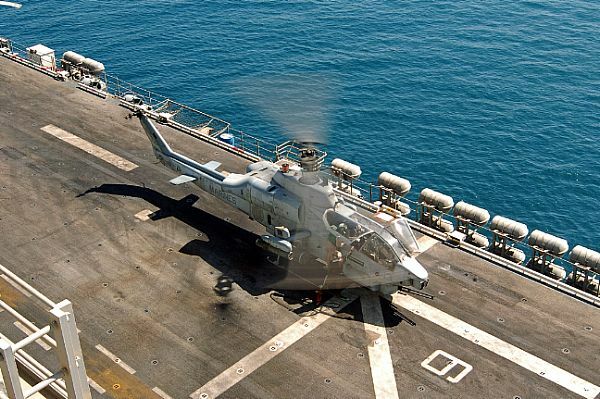 PERSIAN GULF (March 9, 2008) An AH-1W Super Cobra assigned to Marine Medium Helicopter Squadron (HMM) 166 (REIN) warms up its engine before taking off from the amphibious assault ship USS Tarawa (LHA 1). Tarawa is operating in the U.S. 5th Fleet area of responsibility to help deter destabilizing activities and safeguard regional links to the global economy. PACIFIC OCEAN (March 24, 2008) A CH-46 helicopter, assigned to Marine Medium Helicopter Squadron (HMM) 265 embarked on the dock landing ship USS Harpers Ferry (LSD 49), receives supplies during a vertical replenishment with the Military Sealift Command combat stores ship USNS San Jose (T-AFS 7). Harpers Ferry is assigned to the Essex Expeditionary Strike Group. 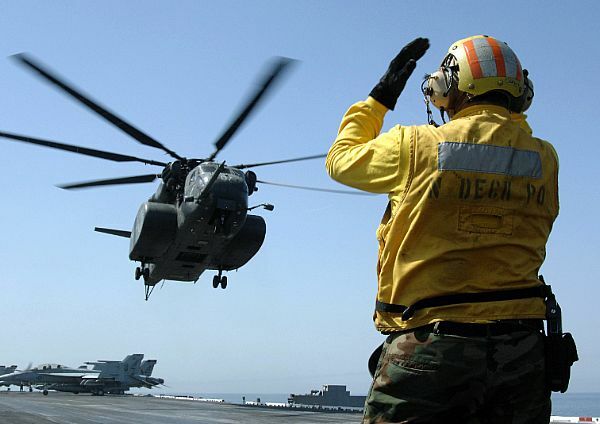 PERSIAN GULF (March 24, 2008) Aviation Boatswain's Mate (Handling) 1st Class Douglas Uminn guides an MH-53E Sea Dragon assigned to the "Blackhawks" of Helicopter Mine-Countermeasures Squadron (HM) 15 aboard the Nimitz-class aircraft carrier USS Harry S. Truman (CVN 75). 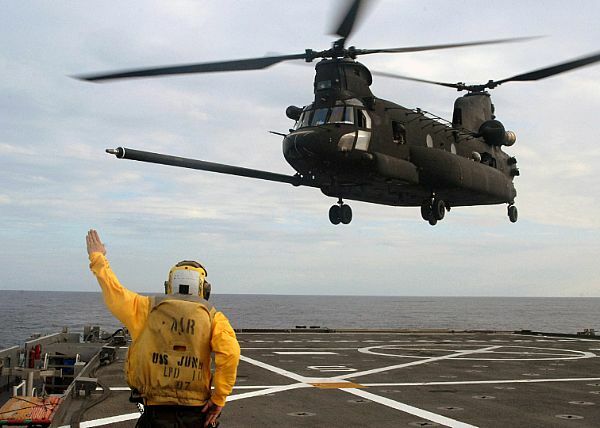 Truman and embarked Carrier Air Wing (CVW) 3 are deployed in support of Operations Iraqi Freedom, Enduring Freedom and maritime security operations. PACIFIC OCEAN (March 30, 2008) Members of "Unexpected Company" Team One, a helicopter visit, board, search and seizure (HVBSS) team, deploy onto the flight deck of the Nimitz-class aircraft carrier USS Abraham Lincoln (CVN 72) during an air power demonstration. The VBSS team is delivered onto the carrier by an HH-60H Seahawk assigned to the "Golden Falcons" of Helicopter Anti-submarine Squadron (HS) 2. Lincoln, embarked CVW-2, and the rest of Carrier Strike Group (CSG) 9 are on a seven-month deployment to the U.S. 5th Fleet area of responsibility. PACIFIC OCEAN (April 1, 2008) An AS-332 Super Puma helicopter transports supplies from the Military Sealift Command combat stores ship USNS Concord (T-AFS 5) to the nuclear-powered aircraft carrier USS Nimitz (CVN 68 ). 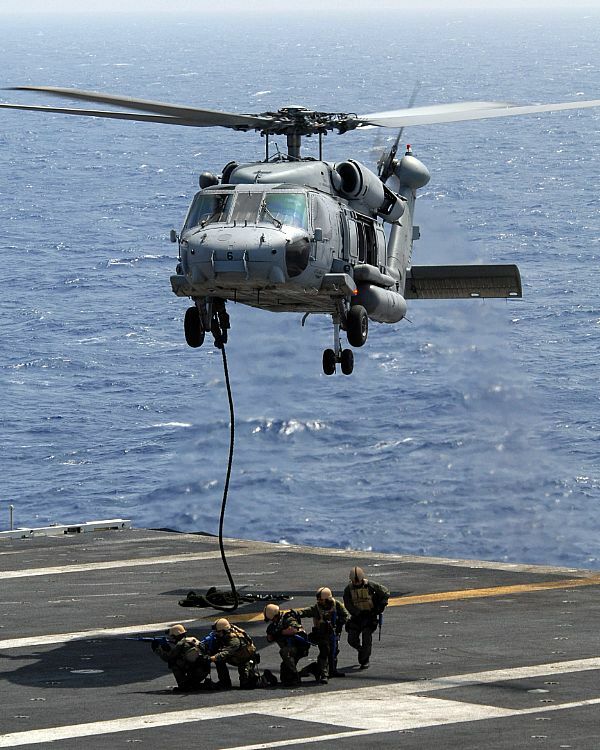 Nimitz is deployed to the U.S. 7th Fleet operating in the western Pacific and Indian oceans. 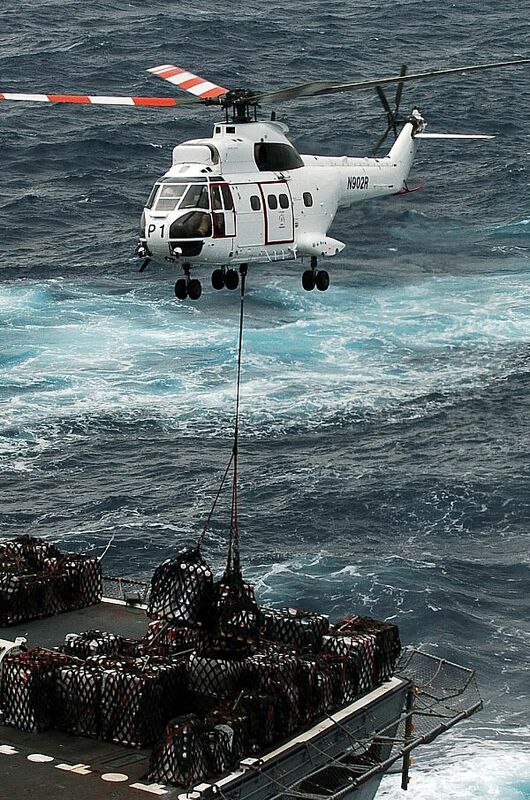 PACIFIC OCEAN (April 5, 2008) Two AS-332 Super Puma helicopters transport supplies from the Military Sealift Command combat stores ship USNS Niagara Falls (T-AFS-3) to the Nimitz-class aircraft carrier USS Abraham Lincoln (CVN 72). 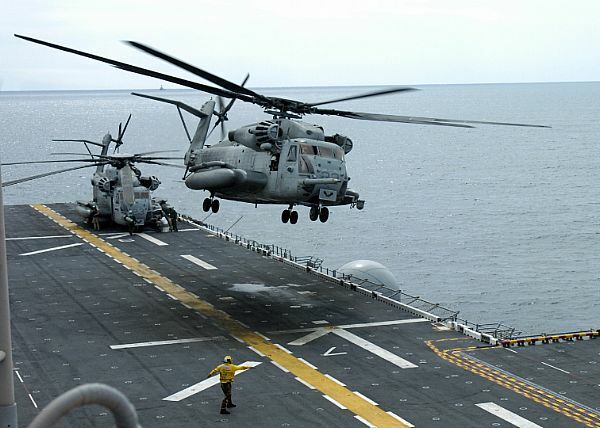 Lincoln and embarked Carrier Air Wing (CVW) 2 are on a scheduled seven-month deployment to the 5th Fleet area of responsibility. 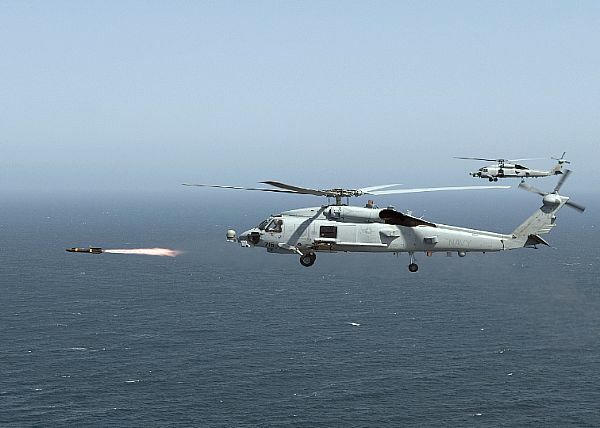 SAN DIEGO (April 24, 2008) An MH-60R Seahawk assigned to the "Raptors" of Helicopter Maritime Strike Squadron (HSM) 71 fires the first of four live Hellfire missiles fired by aircraft assigned to a deployable squadron. 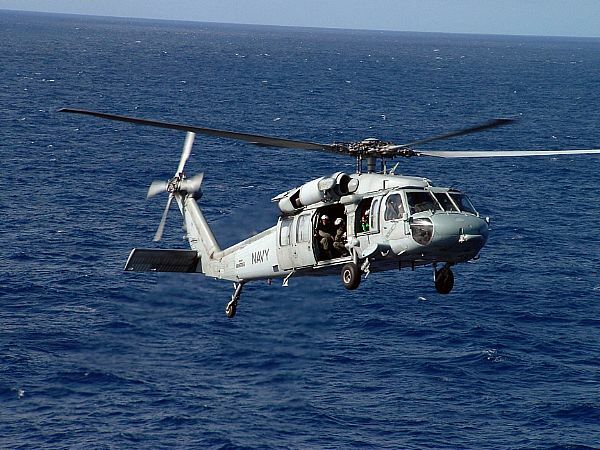 The first MH-60R squadron aircraft is replacing the SH-60B and SH-60F aircraft to combine the capabilities of the two aircraft and has the capability to deploy the AGM-114 series Hellfire missile laser-guided precision air-to-surface missile. 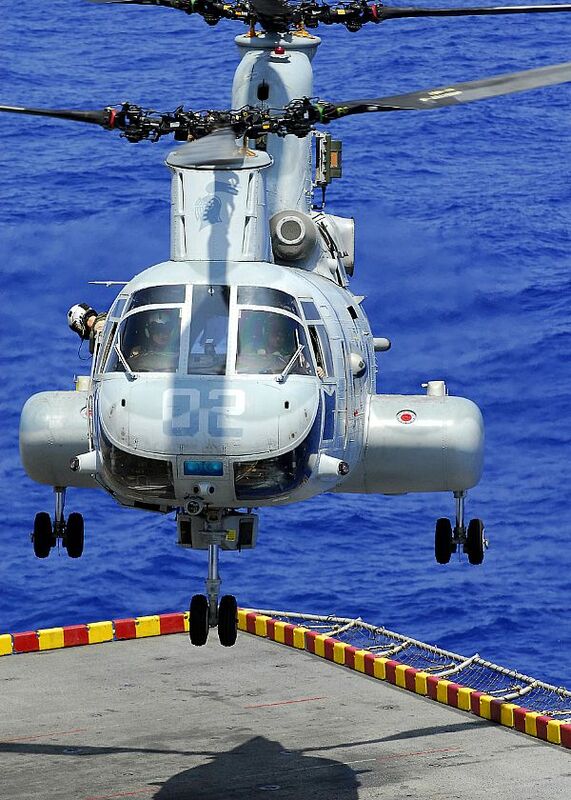 ATLANTIC OCEAN (May 14, 2008) A CH-53E Super Stallion assigned to Marine Medium Helicopter Squadron (HMM) 264 takes off from the multi-purpose amphibious assault ship USS Iwo Jima (LHD 7). Iwo Jima is participating in the Iwo Jima Expeditionary Group integration training. PACIFIC OCEAN (May 15, 2008) A CH-46E Sea Knight helicopter descends to the flight deck of the amphibious assault ship USS Peleliu (LHA 5). Peleliu is on a scheduled deployment.